April 2018 Update has been terminated. We are preparing the procedure to install October 2018 Update. Please wait for a while. 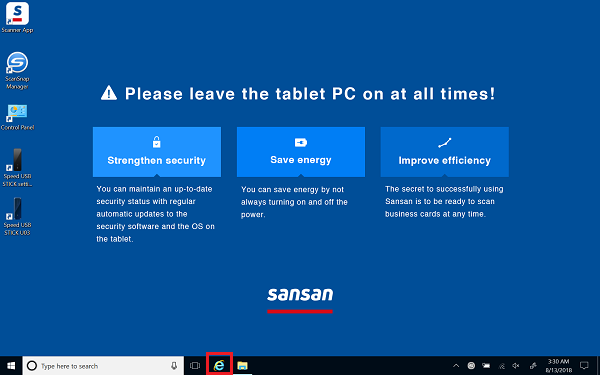 Follow the steps below to install the October 2018 Update of Windows 10 on your device and ensure compatibility with Sansan. *Images and instructions provided here are using Internet Explorer on a tablet. We suggest using the same combination. This update only applies to devices running Windows 10. 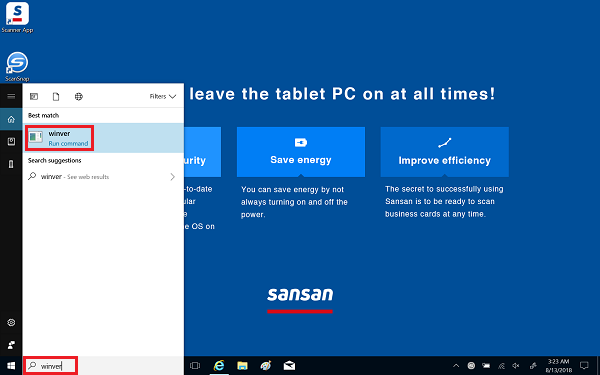 For Windows 8.1, no action is necessary. If you're using Version 1809, no update is needed. However, if you upgraded to 1809 as per these instructions, follow Changing Your Device’s Settings below. Please contact our support center if you need assistance. The update can take a few hours, so please plan accordingly. Please do any urgent scanning of cards beforehand. 2. From the desktop screen, enter “winver” (no quotation marks) in the search bar in the lower left. 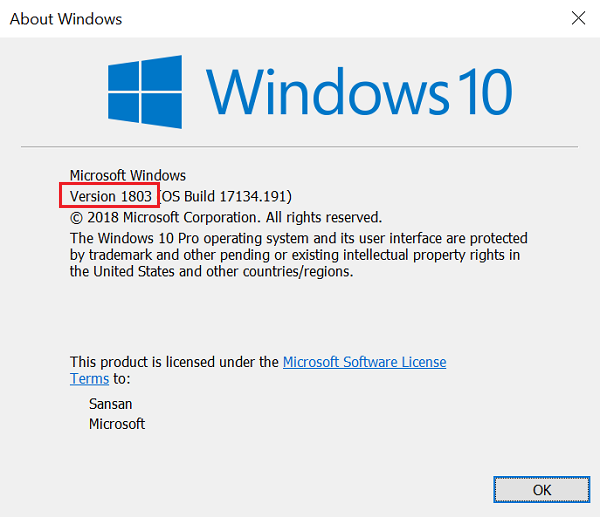 Confirm that Version 1803 or earlier is running, then close the window. *If you're using Version 1809, no update is needed. However, if you upgraded to 1809 as per these instructions, follow Changing Your Device’s Settings below. *If you’re on Version 1709, it should look like this. 5. If you receive the message [Do you want to run or save…?] choose [Run]. 6. The message [User Account Control Do you want to allow this app to make changes to your device?] displays. Choose [Yes] and wait for the next message. 7. 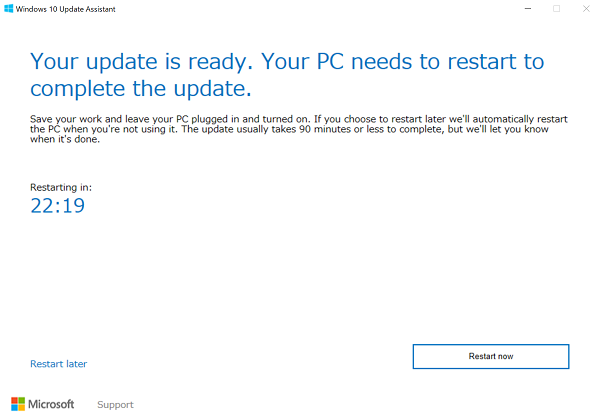 Windows 10 Update Assistant will begin. 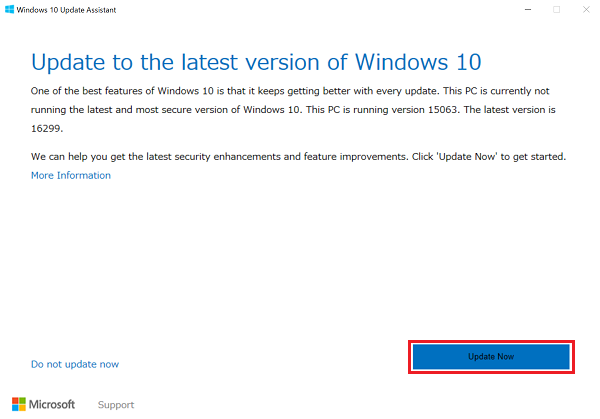 When [Update to the latest version of Windows 10] displays, choose the [Update Now] button. 8. 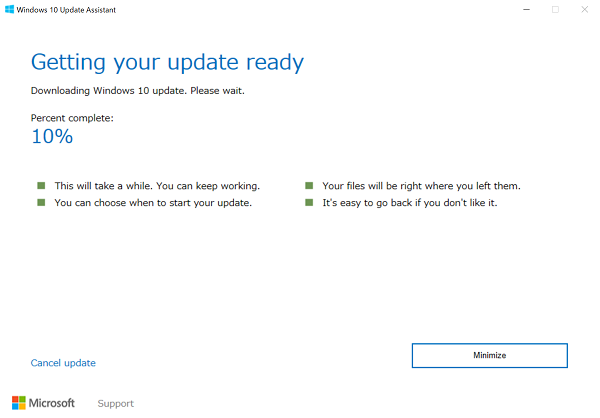 After [Congratulations, this PC is compatible] appears, you’ll see [Getting your update ready] and the update will begin. *Please be aware the full update may take several hours. 9. When the update is complete, [Your update is ready. Your device needs to restart to complete the update.] will display. Restart the device or it will automatically do so in 30 minutes. 10. After restarting, close Microsoft Edge if it opens. 11. 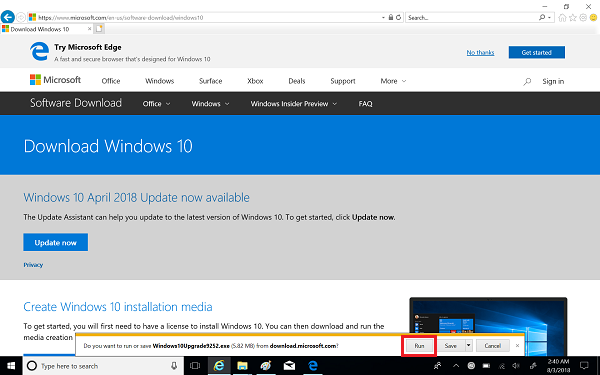 Following steps 1 and 2 to verify you’re updated to version 1803. Close the window after verifying. 14. 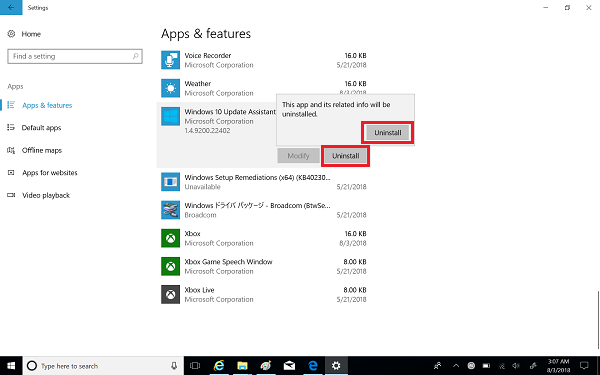 From the [Apps & features] screen, click the [Uninstall] button on [Windows 10 Update Assistant]. After [This app and its related info will be uninstalled.] displays, choose [Uninstall]. 15. The [User Account Control] screen will open. In reply to [Do you want to allow this app to make changes to your device? ], choose [Yes]. 16. 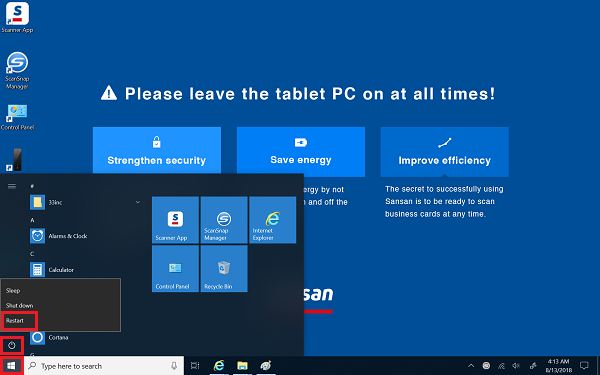 The [Windows 10 Update Assistant] screen will display. 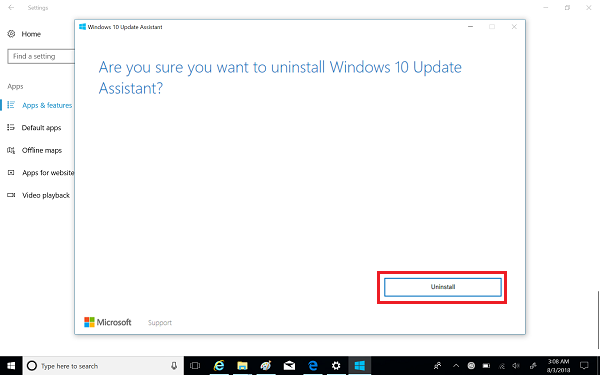 When [Are you sure you want to uninstall Windows 10 Update Assistant? ], click [Uninstall]. 17. 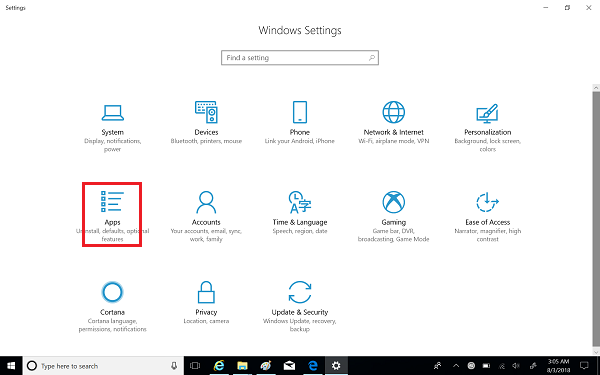 Close the settings display when the uninstall screen closes. You now need to download the file patch_1809.zip and apply setup.bat. Please follow these steps. (2) When [What do you want to do with patch_1809.zip?] is displayed, choose [Save]. (3) When the download is complete, choose [Open folder]. (4) Long press on patch_1809.zip, and when the right-click menu is displayed, click [Extract All...]. (5) On the [Extract Compressed (Zipped) Folders] screen, choose [Extract]. (6) Click setup.bat in the patch folder to select it, long press on it, and when the right-click menu is displayed, choose [Run as administrator]. (7) When [Windows protected your PC] displays, choose [More info]. When [App:setup.bat Publisher:Unknown publisher] displays, choose [Run anyway]. *Please note this may not always display in all cases. (8) Select the icon ( ) when it appears in the system tray. [The User Account Control] screen will open and [Do you want to allow this app to make changes to your device?] will display. Choose [Yes]. (9) The command prompt screen will display. When the process is complete, the screen will close. *Don’t worry if you see red text in the command prompt; it doesn’t indicate a problem. *If an [Overwrite?] confirmation screen appears, touch the command prompt screen. 19. Finally, reboot the device by touching the Windows icon in the lower left and choosing [Restart]. Your device is now updated. I would like to know the OS of the tablet PC.